Transuranic waste barrels are loaded for transport to WIPP, the first TRU waste loading operations in five years at the Laboratory's RANT facility. 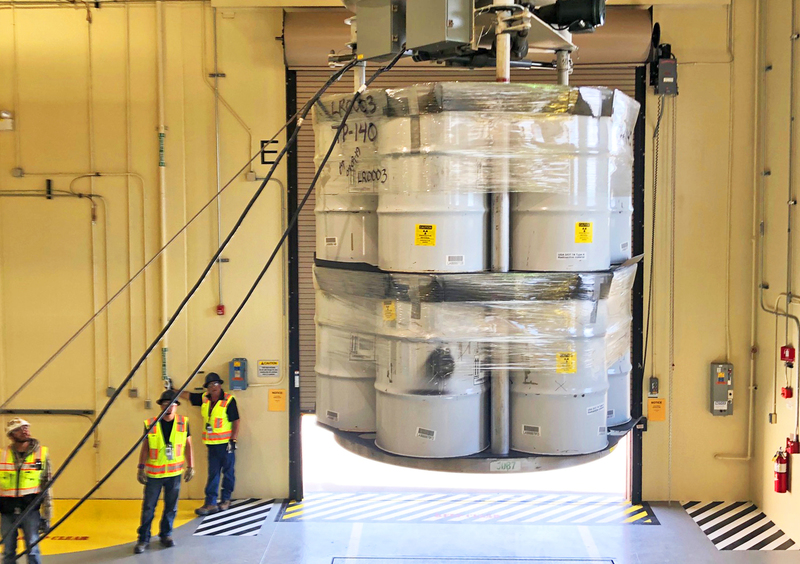 Los Alamos, New Mexico, April 12, 2019 — The first shipment of Transuranic (TRU) waste from the newly reopened Radioactive Assay Nondestructive Testing (RANT) facility at Los Alamos National Laboratory has been successfully delivered to the Waste Isolation Pilot Plant (WIPP) near Carlsbad, New Mexico. "The reopening of RANT and resumption of waste shipments to WIPP puts Los Alamos in a stronger position to fulfill its national security mission," said Laboratory Director Thom Mason. 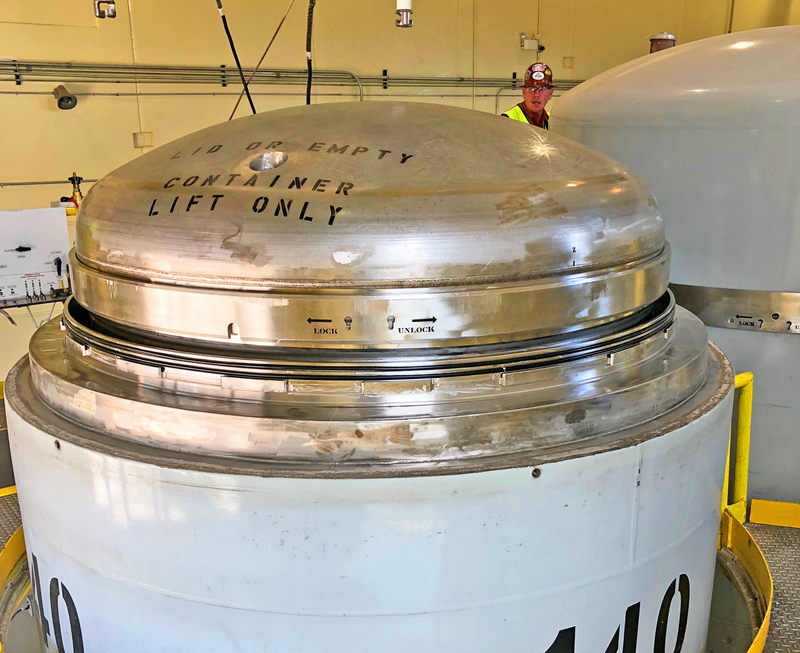 "As the Laboratory works to meet the Nation's future plutonium manufacturing and science goals a robust and continuous waste disposition program is more important than ever." Los Alamos is currently the largest producer of TRU waste in the nuclear security enterprise. As plutonium manufacturing increases so will the amount of TRU waste generated. Successful operations at the Laboratory and at WIPP will be crucial to meeting these goals. The RANT facility serves as an indoor TRU waste loading capability for the Laboratory. TRU waste shipments to WIPP were last loaded out of RANT in May of 2014 after questions arose centered on the facility's ability to withstand a large earthquake event. "Getting the RANT facility back in service and successfully moving TRU waste to WIPP will add to our operational and safety margins and provide a better level of efficiency as we continue to improve our waste operations," said Kelly Beierschmitt, Deputy Laboratory Director for Operations. As the Nation's Plutonium Center of Excellence Los Alamos operates the most modern, fully operational, full capability plutonium science and manufacturing facility in the United States. Plutonium operations support a wide range of national security programs that involve stockpile stewardship, plutonium processing, nuclear materials stabilization, materials disposition, nuclear forensics, nuclear counter-terrorism, and nuclear energy. Transuranic Package Transporter Model 2 (TRUPACT-II) containers are readied for transport to WIPP from the Laboratory's RANT facility on April 10.